A big thank you to AHS and the members of the selection committee for honoring me with the Eunice Fisher Award! I was very surprised to be so honored, as Carol Brashear had kept my nomination a secret. What a lovely surprise! As my friend CH is reading this, I am playing oboe in the symphony, one of my other passions in life! 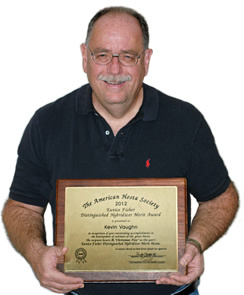 One of the nicest parts of winning an award like the Eunice Fisher Award is that you get to reflect upon your career as a hybridizer and thank all of them that impacted your career. I was very lucky to have lots of wonderful people that helped me with my hybridizing. My career as a plant breeder started at the ripe age of ten, when my neighbor in MA, Polly Bishop, showed me how to cross plants. I was a real “Pointdexter” as a kid, being fascinated by all things in science. When Polly invited me to make crosses of the Sempervivum in her garden, it was something I couldn’t pass up. The crosses that I made that summer, amazingly, netted two hybrids that were unique. S. ‘Silvertone’ and Jovibarba ‘Emerald Spring’ were my first hybrids marketed, the first of many in a wide array of genera. At that time, there was a large group of gardeners in MA, and many involved in a variety of genera. Once the word was out that this kid in Athol was crossing plants, I had no end of wonderful plants that came to my yard as gifts to further my hybridizing interests. One of the first most generous of the plant gifts came from Frances Williams, who arrived in my yard with her daughter, along with a trunk full of some amazingly rare hosta, including H.‘Beatrice’ and H.‘Frances Williams’, that became the basis of my lines. Frances’s advice to me was, “It would be good if you started crossing these, Kevin.” The plant of ‘Frances Williams’ immediately intrigued me; everyone that came to the yard wanted that plant. One of my credos in hybridizing is “When you don’t know what you’re dealing with genetically, self the plant. It will tell you.” I quickly learned the term CHIMERA, when the progeny from selfing ‘Frances Williams’ were 95% blue and 5% gold and nary a variegated plant! Not being one to waste efforts, these seedlings became the basis of my blue and gold breeding efforts. ‘Beatrice’ gave some surprises when selfed too. ‘Beatrice’ is a fairly wimpy plant, but the selfed progeny were actually better growers (generally this is not true in plant breeding!) and gave me a full range of variegated types, from edged to center variegated and all sorts of splashed patterns. Each year I would select the best variegated ones and self them for another generation, to keep a steady supply of streaky plants for use in crossing. Some of these seedlings were shared later with Mildred Seaver and the Lachmans for their hybridizing programs. Florence Shaw was another early visitor, and we also visited her lovely garden in Weston, Massachusetts. Florence was an incredibly sweet person, and she had the financial resources and garden situations to grow essentially all of the hosta available at this time. Her zest for gardening and knowledge of plants were inspiring. Her property was very shaded, and she was worried that so many of my hostas were getting too much sun. On her property, the gold hosta were barely chartreuse, and she thought exposing them to too much sun was just short of torture! She had some of the first plants of H. nigrescens and ‘Elatior’ and had made crosses of them with some of the variegated tokudama types and ‘Bengee’, an early gold-leaved hybrid from her friend Dr. Benjamin Harrison. Interestingly, many of these nigrescens seedlings were much bigger than nigrescens, which surprised both of us. My grandmother came with us on one of those visits and chided me, “Kevin, you really need to make some really big ones like Mrs. Shaw has!” In her garden I saw the first yellow and white variegated plants, the results of ‘Marble Rim’ X ‘Bengee’ and other gold hosta. Florence was a very generous person, and she gave me plants of ‘Green Piecrust’, “helenoides albo picta”, and ‘Goliath’ that were rare as hens’ teeth back then. Both ‘Goliath’ and ‘Green Piecrust’ would be parents for some really big seedlings that my grandmother had suggested! Florence was particularly impressed with a blue in my patch that would later be named ‘Polly Bishop’, as it had such rounded and cupped leaves and blooms that were much better than other blues in that they weren’t buried in the foliage. She suggested that it would be an excellent parent in combining with other lines. Truer words were never spoken, and I wish that she had lived to see this prophecy come true. ’Hearts Content’ and ‘Tijuana Brass’ both owe their interesting leaf texture and form to ‘Polly Bishop’. One of the things that Florence taught me was the growing of seedlings under lights in a greenhouse to get bigger plants to row out. As I entered Clark University in 1972, I used the greenhouse there to raise my seedlings and took Florence’s advice a step further by continuing to grow the seedlings to flowering. Amazingly, the plants would bloom from seed in six to eight months, and new plants would arise at the base of the original seedling plant. This allowed me to grow several generations of plants in the time that it would’ve taken one generation to grow to blooming size in my yard. The simultaneous flowering of diverse lines also gave me the chance to combine species/lines that would’ve been nearly impossible in my yard. The results from these crosses so fascinated me that I decided to use these plants as my PhD thesis material. 82 of the hybrids, that I had created came with me to graduate school at Miami of Ohio and a seed crop harvested by my mom from crosses made in Massachusetts would soon follow. At Miami I had three greenhouse bays that I could use for growing plants and, by adding lights 24/ 7, the seedlings grew incredibly; almost 8000 variegated plants were grown during my graduate student days. Although I was still relatively a novice, I realized what I was producing were incredible breakthroughs in breeding. My favorites were the ones that combined my ‘Beatrice’ line with the ‘Frances Williams’ blue line. I brought the first 27 of these selections back to MA the next season and another 43 (38 variegated and 5 blues) the next season, so that my mother could grow them on for me, and I also could make crosses on them with the material in my yard when back visiting my folks. These visits back home also included visits with the Lachmans and Mildred Seaver. When the Lachmans and Mildred Seaver saw these plants, they couldn’t believe the progress that occurred in just one generation from the ‘Beatrice’ material. Mildred and Bill both picked out plants that would be their namesakes, ‘Mildred Seaver and ’William Lachman’, and I also gave Mildred two other hostas that I’ll describe in more detail at the end of my remarks. Unfortunately, most of the other variegated plants were stolen from my parents’ yard. I had brought pieces of some of these plants back to Miami, and also I still had many other related plants back in the greenhouses at Miami, so the lines weren’t dead, just set back. My fragrant line was slightly larcenous! Right near my apartment at Miami of Ohio was a wonderful garden with H.plantaginea and, of course, this was a great source of pollen. I would pick anthers each day from the fresh blossoms and bring them to cross with the hostas in the greenhouses. I was shocked in that I got 100’s of pods, and the seedlings germinated well as H. plantaginea is so isolated from the other hosta species and very different in so many characters. I planted out all these potentially fragrant hosta in one greenhouse. As the 100’s of seedlings began to bloom, the smell of arbutus or gardenias was overwhelming. Many of these hosta seedlings had flowers larger than plantaginea, and there were several hundred variegated ones amongst the fragrant ones from combining the ‘Beatrice’ line with plantaginea. Some of these were amongst my stolen plants that I had brought back to my folks. Most amazingly, these fragrant hosta seedlings were highly fertile, producing large pods of seed. This seemed especially amazing, as Frances Williams described her ‘Sweet Susan’ as a “near dead end” and many of these seedlings were of similar ancestry. I only had a few seedlings from ‘Sweet Susan’ in all the years I grew it. Another surprise was that many of the flowers were darker than most hosta flowers, despite the white flowered plantaginea as a pollen parent. The only really pale ones came in crosses to other white or near white flowers. Most of my subsequent hybrids were derived directly from these lines of breeding that started with the generous gifts from Frances and Florence. Curt Hanson rescued many of my hybrids from a nursery in Ohio, and Mark Zilis of Q&Z Nursery subsequently offered most of these hybrids. Mark and I first met in Minnesota at the AHS convention where we were both speakers at the banquet. As I remember, we were both scared speechless but did manage to get our presentations off. These were the first of the scientific programs to AHS. Mark wrote a very touching inscription when I received a copy of his wonderful book. That has a very special place on my bookshelf. The only exception to the line breeding of hostas from my own lines was when I first grew H. pycnophylla. The nearly white backs and gently rippled leaf margins set my mind spinning as to the possibilities of new hybrids. In typical Vaughn fashion, I took the pycnophylla pollen “to the ranch” and it gave all sorts of interesting seedlings. I remember my mom asking me why I was using this plant in my crossing, as it didn’t look too exciting to her. When I showed her the white leaf backs, she just shook her head and said, “No one is going to turn over the leaf to see that!” She might be right, except for us hosta geeks! One beautiful seedling that was a cross of a variegated seedling and pycnophylla was one of her favorites for its low spreading habit and pleasant variegation and was christened ‘Shirley Vaughn’. My mom passed in 2011 and it pleases me every time I see this plant that she got to enjoy this plant and was tickled to have it named for her. Certainly, for all the care she gave my plants, plus the visits to gardens when I was too young to drive (or too scared to tackle I-495 at rush hour! ), she certainly deserved this honor. Although I continued to cross hosta for a number of years in Mississippi, conditions there were much more difficult, and my parents were having problems with voles, so bringing them back there became dicey at best. Curt had saved pieces of a number of my hybrids in his garden, and he sent pieces of a number of these back, now that I’m in hosta-friendly Oregon. Similarly, Don Dean and CH Falstad sent me plants of a number of hosta that would be interesting parents. So, after a considerable hiatus, I’m crossing hosta again. As I write this, I am in the process of rowing out several hundred seedlings from last year’s crosses. 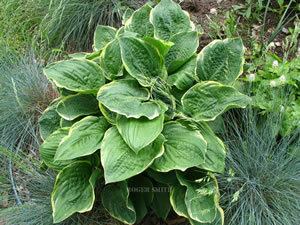 You might see a few more Vaughn hostas quite soon. I have selected ‘Christmas Tree’ as the plant to be honored. It has an interesting story. When I gave Mildred Seaver and Bill Lachman their hosta namesakes, Mildred had admired a sister seedling that, while nice, was not my favorite. There were seven divisions, and I gave Mildred a two-division piece to grow in her yard. The next year Mildred brought back a plant and just asked me, “What do you think of this?” Of course, I thought it was HER seedling and I said, “It’s your best work. What is it?” She laughed and said, “It’s yours!” The plant was blooming and the large scape leaves with flowers and Bill Lachman said, “It looks like a Christmas tree,” and so the plant was christened. I gave both Bill and Mildred a division of the remaining part of the clump that was medio-variegated, one registered subsequently as ‘Christmas Tree Gala’ and a plant of ‘Breeder’s Choice’, that was my selection when I won the Alex J. Summers Award. Both ‘Christmas Tree Gala’ and ‘Breeder’s Choice’ have been used to make a number of other lovely hybrids. The remaining pieces of the ‘Christmas Tree’ clump left in my parents’ garden were stolen and renamed ‘Grandmaster’, but it is the same plant. ‘Christmas Tree’ has been propagated extensively and is even found at the big box stores for sale. It won an Award of Merit in the Benedict Garden Awards system, so I’m not its only fan. Here in the Pacific Northwest, it grows bigger than I have ever seen it, as large as ‘Frances Williams’, its pollen parent. As I was looking through my notes to prepare for this acceptance speech, I came across a note in my notebook about some seed that Eunice had sent me in 1969 of ‘Purple Profusion’ as it occasionally threw variegated seedlings like ‘Beatrice’, and one of the seedlings, with exceptionally dark flowers, was one I grew for years and used in hybridizing. Thank you, Eunice, for your help way back when, and it makes the award extra special that I was touched by the person for whom it is named.